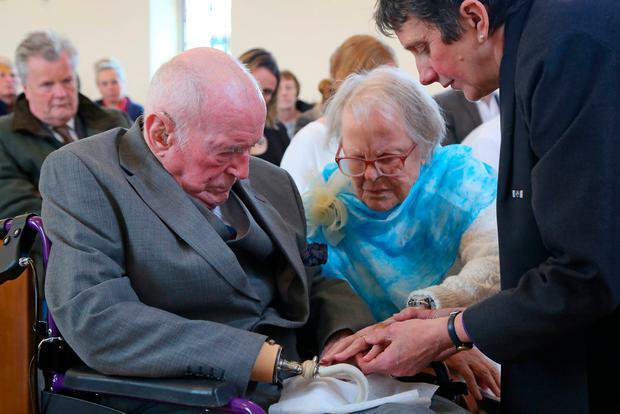 Peter Van Zeller and Nancy Bowstead, both 97, celebrated their new-found romance with a ceremony at the Blind Veterans UK’s chapel in Ovingdean, near Brighton, yesterday. The pair, who both served in World War II, met in May last year at the sight loss charity’s training and rehabilitation centre, where they now live. Mr Van Zeller proposed just over six months later and the pair decided to make a formal commitment surrounded by family and friends. They held hands throughout the service, which had all the hallmarks of a wedding without the legal formality of a marriage, in a chapel. Mr Van Zeller, who was in the British air force and army, said he fell in love as soon as he met Mrs Bowstead, adding: “She definitely had a spark about her and we hit it off immediately. Ms Bowstead, who served in the auxiliary territorial service, joked Mr Van Zeller was “a little grumpy at first” before they got chatting, adding: “It was just like an electric shock. The pair both lost their sight much later in life – both due to glaucoma and after Ms Bowstead had two strokes, while Mr Van Zeller also had macular degeneration.